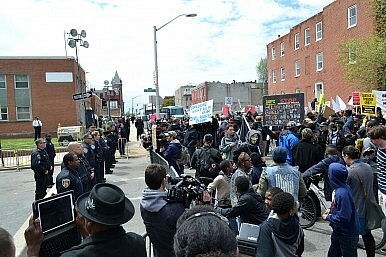 China’s response to the riots in Baltimore reflects a history of sympathy between communists and civil rights activists. Last month, People’s Daily published an argument that the Baltimore riots and other recent ethnic conflicts “expose the institutional fragility of American society.” Yes, the riots in Baltimore underscore the city’s economic inequality and public violence sparked by police killings of unarmed African Americans is a chronic problem. However this is the epitome of what Chinese call wuya xiao zhu hei (the crow laughing at the black pig), or the pot calling the kettle black. It also points to an old misunderstanding that dates back to before the PRC even existed. One wonders what Newton or Du Bois would’ve made of the 1988 anti-African protests in Nanjing, where 300 Hohai University students broke into the African dorms, locked occupants inside, and set the building on fire. Within a day, the anti-African protest was 3,000 strong. Or the incident in Kunming in 2013, when a dispute between an African-American and a street vendor ended with the American hiding in a Western restaurant and an angry mob yelling racist death threats and throwing bottles at patrons. Or the 2009 and 2012 protests by Guangzhou’s African community, which began after Africans died fleeing police or in police custody. Or the practice, documented in The East Is Black: Cold War China in the Black Radical Imagination, of creating white supremacist groups in prison camps during the Korean War in order to demoralize African-American soldiers. In a 2010 talk at Sichuan University Joe Lockard, an antislavery scholar and English professor at Arizona State University, explained that despite shared principles, both sides failed to see that their opponents — imperialists and white supremacists — were not the same. Du Bois and others believed in a chimerical China and leapt into a revolution they did not understand. The great miscalculation was witnessing China’s persecution and concluding that “China is colored.” Actually, given the treatment of its own minorities and the government’s incredible power, it might be more accurate to say that the Han is the white man of Asia.